If you want a bit more information, here we go. Moro Corporation (MRCR) is a construction and construction materials company founded by David Menard in 1999. Menard has always been the man in charge and at the moment holds the titles of president, chairmen of the board, CEO, and CFO. Menard is 77 years old. Menard's son, Peter, was a VP and director until he passed away in 2011. 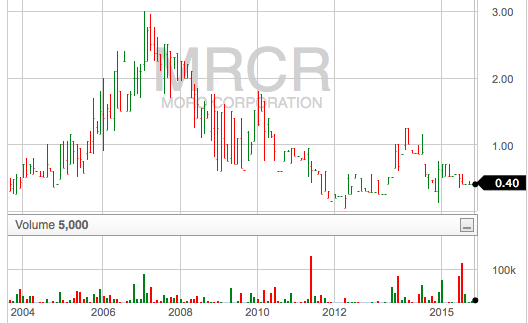 MRCR is an acquisition based company. Actually Menard is also the CEO of a private investment banking firm that he founded and has managed and overseen over 100 merger and acquisition transactions. MRCR entered the construction business in 2000 with the purchase of Ahle and the construction materials business in 2002 with the purchase of Rado. Since then they have purchased Whaling in 2004, Appolo in 2006, J&J in 2007, Titchener in 2010, and Rondout in 2010. They do HVAC, steel work, sheet metal work, and electrical. At the end of 2013 MRCR began winding down Rado. Menard owns 55% of the company. The COO, Lawrence Corr, is 72 years old and became a director in 2012. He also has been a steady buyer of stock: he had 5% of the company in 2013, 6.8% in 2014, and now 8.5% in 2015. Menard has not taken a salary in at least 4 years, I did not check past that. He said he has not always done this but has no plans on when to take a salary again. Currently you can only get quarterly financials from Moro by asking for them. They send out an annual report and proxy to shareholders in the spring. I'm surprised they provide quarterly info for a dark-ish company of this size. Moro filed with otcmarkets.com from 2004 until the end of 2014. CEO tells me they stopped to save money. Moro's website looks to me like it was last updated in the spring of 2011. They posted annual reports there until that date. I imagine they'll go back to filing with otcmarkets once they have more money available but I haven't asked. Below are the operational results for the past 11 years (in per share units), which is as far back as I can find. The secondary axis is only for the revenue line. Few things to note here. You can see profitability has been in decline since 2007 and is now hovering around 0. Book value is above tangible book as a result of the acquisitions. BV and revenue went up with acquisitions and have declined with discontinued ops as well. MRCR declared Rado discontinued in 2013 so you can see income from continued operations rising above total income for the past few years. I think Rado is almost closed up completely and they've been selling off the equipment. Bad weather 2015, 2014, 2013 in areas served, 2008 – 2015 financial crisis, downward construction trends, heavy competition, trends are now improving. When necessary, the company has issued debentures to fund operations and acquisitions. They raised $425k in 2002, $1275k in 2006, $500k in 2009, $350k in 2010, and $275k in 2012. The maturities have been pushed back for many of these and there is currently a long term liability of $2.8M on the balance sheet. On September 29, 2014, the Company refinanced its then existing credit facilities with a new bank. The Company determined that it was not in compliance with the required minimum fixed charge coverage ratio as of September 30, 2014 and March 31, 2015, but has received a waiver from the lender. As of December 31, 2014, the Company determined that it was not in compliance with the required minimum fixed charge coverage ratio. Management of the Company has initiated correspondence with the lender in an effort to cure the event of default and expects to receive a waiver. Management expects to meet its obligations through improvement in operations. How funny is that, they refinanced into a non-compliance. The interesting line there for an optimist is "Management expects to meet its obligations through improvement in operations." I asked the CEO what is meant by this and he said, "For example, 2015 and 2016 are benefitting from lower workers’ compensation insurance costs, lower casualty insurance costs, retirement of some highly paid employees either not being replaced or being replaced by lower paid employees and other factors." I asked the CEO about plans for the future but did not get much of a response. He said they are always on the lookout for acquisitions but have no plans at this time. I was hoping he would tell me about his plans to sell the company next month but no such luck... The company is working to get profitable again and if the current management stays I imagine there will be further acquisitions at some point. No company is without issues and Moro has their share. As always there are two sides to the coin. They are currently hovering around 0 earnings. Revenue, earnings, and book value have been in decline for the past few years. They have not been able to pay off debt recently. Generally I'm not a huge fan of the construction industry. The company is semi-dark as they do not file anywhere at the moment but you can get reports by asking. The same management has been running this company since inception 16 years ago. They've been profitable in the past and have weathered storms before. At a price of $0.40, MRCR is trading at only 44% of TBV. Share count is low with heavy inside ownership. The COO has been steadily buying up shares for years. The CEO is 77, COO is 72, and together these men own 63.5% of the company. Management is taking steps to move back into profitability: the CEO has no salary, they are cutting costs, and shedding unwanted divisions. You should focus on what most closely approximates economic reality. In this case, I think earnings give a much fairer picture than free cash flow. Moro's businesses are very lumpy. Working capital movements can free up and consume large amounts of cash in any given period. If you want to look at free cash flow for a company like this, you should look at a much longer period during an entire cycle, say from 2008 until today. Do you happen to have those financials ?